The spacious rooms feature bare wooden floors and large windows. 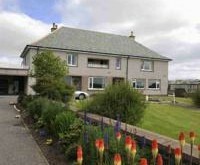 All have an LCD TV and many offer views of Sandwick Bay. Some rooms have an en suite bathroom, and all offer tea and coffee facilities. A full Scottish breakfast is served daily in the breakfast room, featuring Stornoway black pudding. There is also a spacious guest lounge with a large-screen TV, and a number of pubs and restaurants are just a short walk away. With Stornoway Golf Club just a mile away, Sandwick Bay Hotel is just 10 minutes’ drive from Stornoway Airport. Situated on the beautiful Isle of Lewis, ferries to Ullapool leave nearby. Lews Castle is a 10-minute drive away. A free shuttle service is available for guests between the guest house and the airport and ferry port.